Modifications: Did not add red pepper flakes. Just used one onion, didn’t measure out 3 cups. 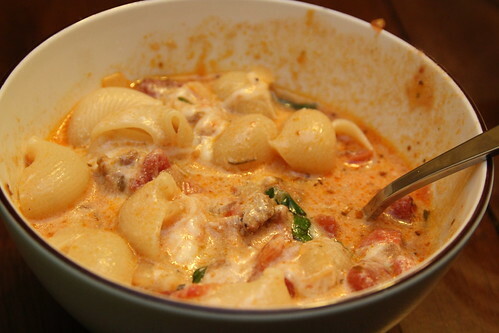 Probably didn’t have quite 2 cups of mozzarella since we had to borrow it from our neighbor’s but it was still plenty cheesy – I added more parmesan to compensate. I made the noodles separately since I knew we’d have leftovers and I wanted them to stay firm. Time to table: About an hour in total, 30 minutes of simmer time. 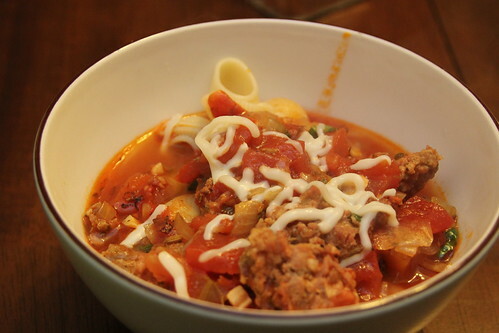 This entry was posted in basil, cheese, garlic, italian sausage, one dish meal, onion, pasta, soup, tomatoes. Bookmark the permalink.